Generally Speaking 34 – Why Not This One? Zendikar block saw a number of card cycles, the most prolific of which were the enchantments in the eponymous first set and Worldwake: the Ascensions, the Quests, and the Expeditions. The Expeditions in the common slot are fairly lackluster; they do not have much impact on the game, except Khalni Heart Expedition, while the Quest cycle, in the uncommon slot had just as few dangerous ones, like Quest for the Goblin Lord which is arguably a staple in goblin decks (and is easily given gravity by Krenko, Mob Boss or Ib Halfheart, Goblin Tactician). The others, at least, had niche roles, like Quest for the Nihil Stone in discard-heavy decks, or Quest for Pure Flame in decks that like to really empty the guns. The rare cycle from Zendikar, the Ascension cycle, contains three heavily played cards in EDH: Luminarch Ascension, which abuses the multiplayer nature of the format and generates extremely efficient and dangerous creatures, Beastmaster Ascension, which is a powerful Overrun-style effect, and Bloodchief Ascension, a card which triggers nearly all the time and creates an uphill battle for all opponents to contend with. Pyromancer Ascension does not see much play in EDH; it’s too hard to activate (though it is possible), but it’s powerful enough to see in other formats. That leaves Archmage Ascension, which is played almost nowhere. Let’s fix that. 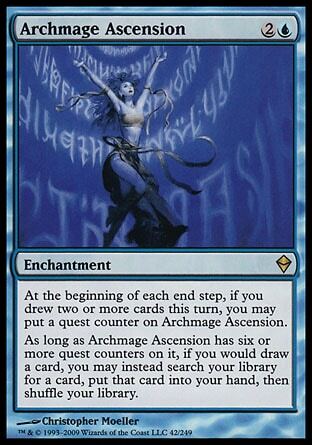 Like the other Ascension enchantments, Archmage Ascension rewards you for stuff that you’d want to do anyway. It is also self-referential; you need to draw cards to put quest counters on Archmage Ascension, but once it is active, your draw spells become tutors instead. Getting Archmage Ascension and six counters on it is difficult. You could tutor for it, but if you’re spending more than one tutor on this or cards to enable it, you’re probably be better off just using tutors to find the targets you’d want to find with Archmage Ascension. Rather, building for Archmage Ascension should probably be a side-strategy, where the cards you use to make it work are ones you might run ordinarily, or are willing to run in place of slightly superior options. So, how do you make this work? 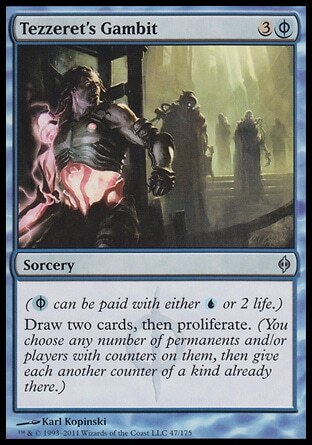 There are two problems with it, the first of which is that consistently drawing two cards in a turn is perhaps more difficult than many of the other conditions on these kinds of enchantments, such as Bloodchief Ascension requiring a player to ‘lose 2 life’, or Beastmaster Ascension requiring you to attack with a creature. The second problem is that you need six of these counters, and you can only get one per turn. The first problem can be remedied in a few ways. Cards that provide a steady source of card advantage, like Jace Beleren (and most other incarnations of Jace), Phyrexian Arena, Bloodgift Demon, Graveborn Muse, Staff of Nin and Aeon Chronicler are going to allow you to put a counter on Archmage Ascension on each of your turns. Cards like Sylvan Library, which aren’t commonly thought of as drawing additional cards without cost do trigger Archmage Ascension even if you put the cards back on top of your library. There are plenty of cards like Merfolk Looter who can do good work for cheap, even though the advantage they provide is not as pronounced as cards that provide a net gain of cards. Further, if you’re willing to spend one mana per turn, you can constantly draw the top card of your library with Sensei’s Divining Top, only to draw it next turn. While this nets you no actual card advantage, you do draw the requisite two cards during your turn. I’m of the mind that if you play enough of the Vintage/Legacy/Modern dig cantrips like Ponder and Preordain, and if you cycle cards on your own turn (like Lonely Sandbar) you’ll be able to get at least a few counters up and running. Of course, relying on cantrips entirely wouldn’t let you really get there; you’d need a huge number of single card draws in your deck to reliably play six in a row (even if you went as far as to include Think Twice), and then you’re hardly faster than the steadier card draw enchantments and creatures. The second problem is that six turns of counters is too slow. This can be fixed by two things: drawing two cards on other players’ turns, and using the proliferate mechanic. The most important test for instant card draw is whether it draws you two cards or not. Commonly thought of cards that don’t ‘net’ you cards will trigger Archmage Ascension. Brainstorm is the perfect card for this: many people think of it as a cantrip, or replacing itself, but it really does draw three cards (even if two have to go back), and you can play it on your opponent’s turn for one mana to get a quest counter. Similarly, Pulse of the Grid can be cast on your opponent’s turn, and offers a chance to be recast on subsequent turns (perhaps during each of your opponent’s turns). The other way to speed things up is proliferate. This is the point where some cards you’ll play will be less than optimal, unless you’re fully into a deck that uses and abuses counters. You can pretty easily play Tezzeret’s Gambit as a stock draw spell to trigger Archmage Ascension and proliferate a counter already on it, but after that, the card quality goes down hill quickly. Contagion Clasp is fun to use to destroy small utility creatures, but often won’t give you much return after that. Similarly, Contagion Engine is the ultra-slow asymmetric board wipe, but can power out counters very quickly. If you’re willing to run these, and cards like Thrummingbird or Inexorable Tide, you could have Archmage Ascension working in no time, but you’ll really need to consider if these cards are worth it on their own merits in the context of your deck. If you’re playing a lot of planeswalkers or have other counter themes, like storage lands or creatures with Level Up, these proliferate engines could be very strong. It’s important to note that with all this talk of instant cantrips and card draw, many spells or abilities will place cards in your hand. Sadly, cards like Fact or Fiction or Impulse do not actually draw you the cards, and that is not enough to meet Archmage Ascension’s requirements. This doesn’t mean you can’t run these, but it does mean that they will probably take the place of a card that would help out Archmage Ascension, and you run the risk of it working out less often. So in what sorts of decks does this side-strategy work best? For starters, decks that have black in them, since most of the steady draw and proliferate effects are in those colours along with blue. It’s fairly easy to play Phyrexian Arena and to simply start adding counters. 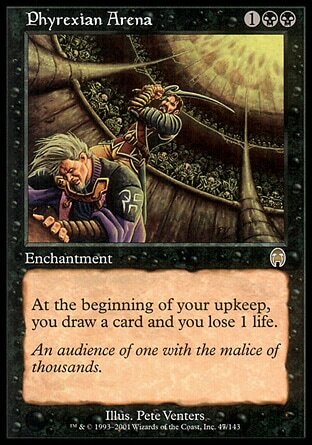 Second, there are many counter themed cards to play with in black, like Black Market. The second deck is one that runs an aberrantly high number of cantrips, like Tibor and Lumia or Isperia the Inscrutable. Tibor and Lumia already gain value from their cantrips through their ‘when you cast’ text, and other similar abilities, and Isperia the Inscrutable uses Clairvoyance variants to guess a card in their opponent’s hand correctly along with other desirable cantrips. Both these generals naturally draw a lot of cards, and can add to Archmage Ascension very quickly. So, what do you do with it? I leave this to you, the reader. You could fish out a two-card combo, take infinite turns with Beacon of Tomorrows, or you could just use it to find the perfect answer and your best threats, every turn. How you make it fun is up to you and your playgroup. Just lay off the Miracles, they don’t work, because once Archmage Ascension is active, you never actually ‘draw’ a card again, you simply search and place it in your hand.